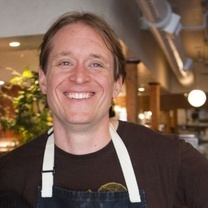 Nicolaus Balla is the chef/co-owner of Duna, an eastern-european inspired restaurant. He opened two successful restaurants in the Bay Area. He is known to use local produce to making anything and everything by hand. He wass born in Michigan but spent some of his childhood in New York, moved to Hungary for part of high school, went to culinary school, and then traveled extensively in Japan while learning to make hand-crafted ingredient. Some people say that what Chef Nick Balla is doing at Bar Tartine in San Francisco is crazy. It ain’t crazy, it’s just layered with the restaurant's unparalleled DIY foods program, his unlikely marriage of Japanese and Hungarian cuisines, and his youth spent playing in a band. Roots takes a deep biographical look into the world's most influential chefs to reveal their inspirations. Ancestry.com style except not really. "Who would you share our chocolate cookies with? #TartineBakery"
"Late night sweet cravings 😍 Swipe left ⬅️ #bartartine"
"Good morning! What are you having today? Photo by @lena.khalifeh #TartineBakery"
"The whole crab may be cooked in plum wine; it is sweet and amazingly delicious. I don't usually order lobster or whole crab in a restaurant, but this experience however is not to be missed." "When Amaryll and Lori put cabbage rolls on the constantly changing menu, it is worth changing all plans to have some. Amaryll is Hungarian and makes cabbage rolls better than all of your mothers." "Gialina is the perfect neighborhood restaurant. The salads can be ordered in a huge size (a salad should be a meal, not just a couple of bites). The salads at Gialina are always delicious, satiating, and made with great ingredients."